Determine what the best angle is for you to market yourself - this is the difference between becoming well known and being just another 'wannabe' pin up model. How to be regularly featured on popular pin up websites and Facebook pages - there's easy ways you can use to become a regular! 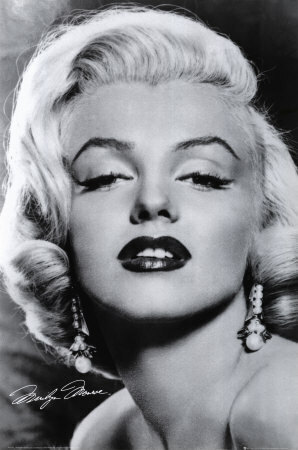 Can You Really Become A Well Known Pin Up Model? "There are many types of beauty & there will always be an audience - perhaps a world, perhaps one person, who will prefer you to all others." As a bonus gift, we'll throw in the 'Secret Confidence Confessions of the Top Pin Up Models' valued at $27. This will help you on your way and help to shatter any limiting beliefs you might have about yourself so you can go out there and live your wildest dreams. It’s fantastic that you are pursuing your dreams. Also congratulations for choosing the pin up industry! It’s such a great industry to be in obviously because the more of these glamor dolls we can have in the world, the better. And another reason this is a fantastic industry is because this is a market not yet too saturated (unlike the mainstream fashion world), which means that you have a far larger chance of becoming a well known model in this industry! With the right steps, tools and information, it’s possible for you to really stand out. Sorelle Amore, Founder of Pin Up Passion has created this guide. Having been running Pin Up Passion for 28 months now, she's managed to build a huge community of over 200,000 people on Facebook. She knows how to create a strong and loyal following, how to build up your numbers and engagement and how to run a Facebook page effectively. More importantly though, having been specifically in this industry, Sorelle has seen a boat load of aspiring pin up models make it and even more aspiring pin up models fail. Through this, she's discover the tips and tricks you need to know to get your brand out there and get yourself known and what NOT to do in the process. These tips can either make or break your chances of rising as a pin up star. If you're serious about wanting to build your brand in this industry, there's no two words about this - you'll need this guide to avoid the mistakes that could ruin your chances of becoming a star. Pin Up models are really known for their high levels of confidence. And being in the limelight requires a huge deal of confidence. So, because I really want to see you succeed, I'll throw in a complimentary copy of 'Secret Confidence Confessions Of The World's Top Pin Up Models'. This is a perfect introduction on how YOU can have sky high confidence in no time. 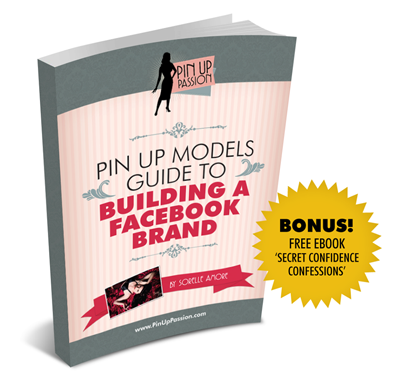 This ebook is valued at $27, but totally free with your investment in the Pin Up Models Guide to Building A Facebook Brand. Hello Sorelle you gorgeous gal! Firstly, I just wanted to say a big thank you for creating this guide and sharing it with us enthusiasts. I really appreciate it. Secondly, I absolutely loved the guide! And I am currently halfway though the Confidence Confessions and I'll tell you what, they are both hard to put down being such a good read! (although it makes it quite hard to get back to work now my mind is a buzz with ideas!) :) I love the voice in which you wrote the guide, easy to follow and made me feel like we were having an informal discussion over a cup of tea. Which made it all the more fun to read. I look forward to implementing your ideas as soon as I can (I 'm currently at the portfolio building stage) but I hope to see you around the community real soon. Hope you are having a lovely day. Well what can I say but wow! Here I am thinking your FB page is the bees knees, but this ebook is the bible! I just love all the advise you have given, and already I have applied it to my Pinup Persona. "The ebook was very informative and honest-- bluntly so-- and a lot of aspiring models need to hear what is says. It's an easy read-- like having a coffee with you, and you giving us your advice. Also, everything is applicable and not out of reach! It's up to the readers to apply it to their life! I've already tried to implement some of the tips to my fanpage." "I really enjoyed your ebook. It was good to know and be assured that I have been on the right track. I did find the " 3 posts a day " very helpful and have implemented them into my Facebook page. My page is more interactive and has more variety. I can now see a trend and will post to suit. This ebook helped me to get more serious with my passion for Pin Up. Thank you"
Will You Be The Next Pin Up Star?